Making a human being mobile easily and without pain has always been a challenge for the medical fraternity. This has forced Doctors to Research & Modify Techniques to reduce the morbidity of the disease & trauma. Degenerative Joint Disease ( Knee & Hip) Is becoming one of the major causes for pain & immobility in the world population with average life expectancy age increasing . Due to changes in lifestyle & lack of exercise & higher incidence of accident trauma this problem is seen in younger age group also. Joint Replacements has provided an Answer to this problem not salvageble by conservative methods , thus making the patient mobile without pain. Chronic Backache is another problem forcing the world population from absenting themselves from their work thus producing the great losses in productivity & in revenue earned by organization . The most common causes of backache in today's world is bad posture, lack of exercise, * REPEATED STRESS INJURY. These problems affect even the excutive classes having sedentary life style & specially the IT sector where employees have to work on the computer for long hours. Most of these cases can be rehabilitated conservatively with help of physiotherapy & exercise regiemes and they respond favourably if treated early. Another cause of chronic bachache is disc degeneration / Disc prolapse which again majority of the time can be treated conservatively rarely requiring Discectomy. With Sports Being taken up as a profession these athletes form a majority of patients who require surgical techniques which whould allow them to pursue their career after SPORTS INJURIES. With the advent of Arthroscopic Techniques, now most of these injuries in the knee & shoulders can be treated allowing the person to continue with his/her activites. 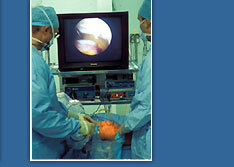 Procedures like menisectomy & ACL Reconstruction has become standard operations in orthopeadics. High Speed trauma causes polytrauma which is a challenge to deal in orthopaedics. 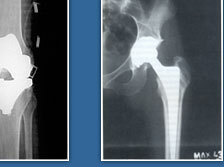 With bone loss & gaps & nonunions techniques like Illizarov have given encouraging results. 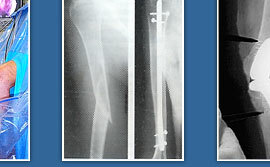 Closed Intramedullary nailing of long bones is another boon for polytrauma cases because blood loss is minimum. & patient can be mobilized early. The Center is headed by Dr. Sandip Gupta M.S. 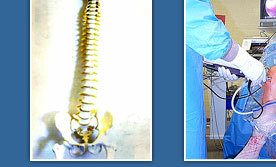 (Orthpaedics) Who has over 15 years of experince in orthpaedics & spine surgery. the centre is well equipped with X-Ray unit & rehabilitation centre. The centre has a vast experince in treating various orthpaedics condition as mentioned above. The Rehablitation Department is well equipped to deal with chronic musculoskeletal pain Eg. repeated stress injury. Surgeries are performed in various hospitals in Delhi. well equipped to handle both major & minor cases. Restoration of proper spinal biomechanics & chronic backache nerve function. is a group of condition from overuse of the computer, guitar,knife or similar motion or tool. It is an occupational overuse syndrome affecting muscles, tendons & nerves in the arms & upper back, usually. It occurs when muscles in these areas are kept tense for very long periods of time, due to poor posture and for repetative motions. It is most common among assembly line and computer workers. -Recurring pain or soarners in neck, shoulders, upper back, wrist or heads. -tingling, numbness, coldness or loss of sensation. -muscles in the arms & shoulders feel hard & wiry when palpated. Knee pain, neck pain, low backache, shoulder pain, nerve impingments, Repeated stress injury etc. a proper posture analysis, your work atmosphere etc and help you out to treat & prevent these problems.